The climate in Chino Hills is one of the reasons why it is being listed in magazines around the world as a great place to live. This great weather leads to homeowners and business owners becoming lackadaisical when it comes to preparing their property for flood and water damage. Don’t get caught with your feet in knee high water, call the cleaning and restoration experts at Superior Cleaning and Restoration Inc. to get your problems taken care of. We are here for you 24/7 and accept many major insurance companies. Our experience puts us above the rest and allows us to provide a superior service. What type of properties do you service for water and flood damage? 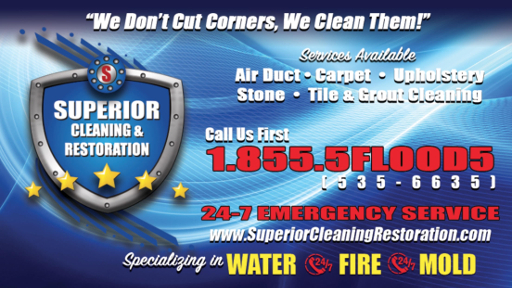 Superior Cleaning and Restoration Inc. can service any property, residential or commercial, for flood and water damage cleanup. We will restore your property to a superior state. How long does water damage repair usually take? It is impossible to tell without examining the property. Get in contact with the professional cleaning and restoration experts at Superior Cleaning and Restoration Inc. in order to get a free quote for repair. We will get you squared away with a plan to restore your property. This is another question that is best left till after an inspection. It is impossible to give an honest estimate on the cost of work. A minor stain on the wall might turn out to be a massive water leak that has been accumulating for years. This is why it is necessary to get in contact with us before the problem worsens. Don’t sit idle while the water causes further damage, call us now. From Butterfield Ranch Road to Chino Avenue, and from Chino Hills Parkway to Grand Avenue, the cleaning and remediation experts at Superior Cleaning and Restoration Inc. are here to handle all of Chino Hills water damage cleanups. Having years of experience gives our experts the edge to provide superior service. We are available 24/7, accept many major insurance companies, and provide a superior service. We will leave your property in a superior state.